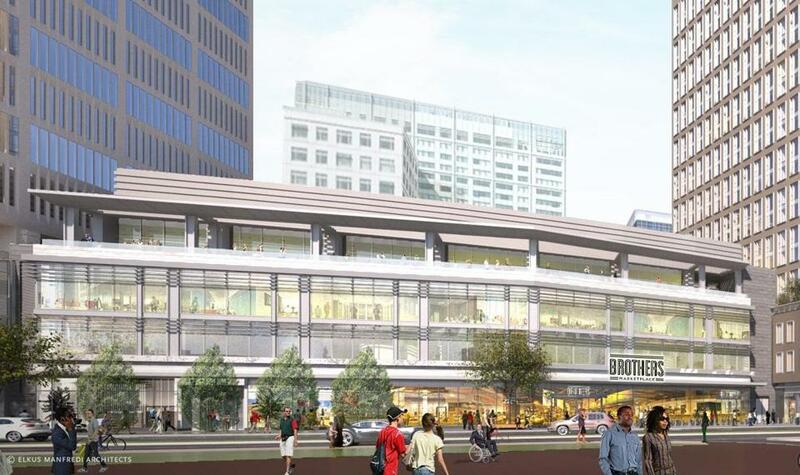 A Brothers Marketplace grocery store is planned for the ground floor of One Broadway in Kendall Square. In Cambridge’s Kendall Square, you can find some of the brightest minds in the world and some of the biggest companies in technology and life sciences. But much to the frustration of those smart people and the companies they work for, you can’t find groceries to bring home for dinner. The Massachusetts Institute of Technology and Roche Bros. said Thursday that they have reached a deal to put a supermarket on the ground floor of an MIT-owned office building at the heart of the bustling business district. It will be a small-format Brothers Market, on Broadway between Third Street and the Longfellow Bridge, and is expected to open in 2019. A grocery store has long been a priority in Kendall Square. About 50,000 people work there, and it has a growing residential population, but the district offers little in the way of neighborhood services. As it planned major development in Kendall Square in recent years, MIT got the message. A supermarket was the “most requested retail use” the university heard as it talked with residents and workers while planning a series of new buildings along Main Street and Broadway, said Steve Marsh, managing director of MIT’s real estate operations. So it’s redesigning the ground floor of the existing One Broadway office tower to make room for the grocer and will build a 300-unit apartment building next door. It made sense to Roche Bros., too, said Arthur Ackles, vice president of merchandising and buying. The Wellesley-based supermarket chain has been expanding in more-urban settings in recent years — opening a store in Downtown Crossing in 2015 and planning to open a Brothers Marketplace in a Waltham apartment building next year — and saw a great opportunity in Kendall Square. At 19,000 square feet, the store will be smaller than a typical suburban Roche Bros. market, with more focus on fresh, prepared, and to-go foods. But it will also stock traditional groceries — aimed at people shopping on their way home from work, as well as residents of East Cambridge. The store will offer parking in One Broadway’s garage. Supermarket chains have been experimenting with mixed-use, urban locations in apartment and office buildings in and around Boston, instead of traditional stand-alone stores. Ackles said Roche Bros. is studying other urban locations but wouldn’t say where. For the denizens of Kendall Square, the grocer can’t arrive soon enough. C.A. Webb, interim executive director of the Kendall Square Association, said its members have long been eager to be able to buy groceries on the way home. The Brothers Marketplace, she said, will fill a huge need, especially as more apartment buildings go up and the neighborhood’s residential population grows. Now all Kendall Square needs is a pharmacy.